Ah, and stuffed peppers. They’re so good! They’re especially good when stuffed with spicy, health Andouille chicken sausage, bronchi corn and brown rice. It’s a delicious little package of protein, vegetables and whole grains. 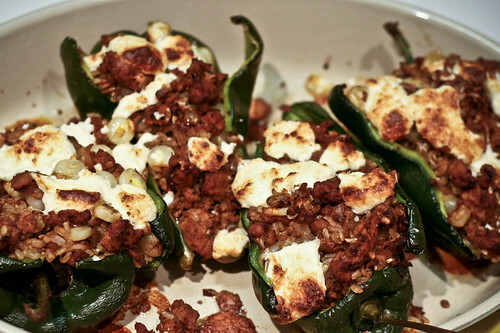 I’ve made stuffed peppers before, but had never used poblano peppers because the ones at my grocery store are usually sad dried up, dusty-looking things. I found some fresh, shiny ones this week and then spotted some freshly made Andouille sausages in the meat case and knew they’d be perfect for each other. 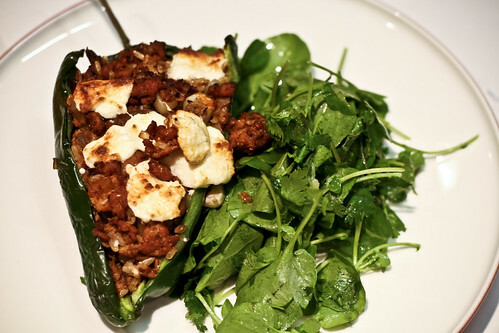 The stuffed poblanos were topped with Cotija cheese, baked and served alongside a lime-spiked watercress and cilantro salad. I could probably eat these every day and be happy. I’m sure Tom wouldn’t mind. In fact, he’d probably love it. Next time, I want to try a breakfast version stuffed with scrambled eggs, diced potatoes and onion (maybe bacon)…a perfect brunch! For a vegetarian option, you can substitute extra-firm tofu that’s been well-drained and marinated with cumin, chile powder, cayenne pepper, olive oil and orange juice and then crumbled into the pan. Or, simply use more corn and more brown rice. If you can’t find fresh Andoille sausages, you can substitute hot Italian sausage, or use ground beef, turkey, chicken or pork and season it with cumin, chili powder and cayenne pepper. Preheat the oven to 375°. While the oven wamrs, set a large skillet over medium-high heat. Add the olive oil, then the onions. Brown the onions for a couple of minutes, then add the sausage. Use a wooden spoon to break up any large sausage chunks and continue to simmer for 8 – 10 minutes, or until the sausage cooks through and browns and the onions turn transluscent. Add the corn and cook for 1 – 2 minutes, then add the brown rice and Enchilada sauce and simmer 5 more minutes. Once the peppers are prepped, place them in an greased casserole dish, alternating the direction of the tops of the peppers (because it’s prettier). Now, stuff them with the sausage mixture, distributing the filling evenly among the 4 peppers. Top with crumbled Cotija cheese and bake for about 25 minutes, until the cheese is melted and browned. While the peppers are baking, toss the watercress and cilantro with the olive oil, lime juice and salt. Serve the peppers warm, on a bed of the watercress and cilantro salad. oh lordy, those would be so good for breakfast. lovely… just lovely. even though cotija cheese doesn’t really melt well, it really is the best choice for that salty addition. i’m obsessed with it! great blog, btw! WANF – Thanks! I’m also pretty obsessed with Cotija cheese right now. I love that saltiness and how it cuts the richness of a lot of dishes. This looks fantastic. I am going to try them with homemade chorizo sausage instead of the andouille though. mel-these delicious looking numbers totally inspired me to make stuffed pepps! they are sooo good and you can pack so much nutritious goodness into those little pacakges. thanks! Is this a recipe you developed yourself??? I made it the other day, and I just can’t get over how well all of the flavors worked together. It was perfect. We changed a few of the ingredients and served it deconstructed (not stuffed) but kept the main component parts. The dish knocked our socks off. Did you ever come up with the eggs, potatoe, onion and bacon recipe for this poblano yet? If so, please post. I’m dying to try it! David – Finally! Just got around to it this weekend. I didn’t put the eggs inside because they’d be way overcooked. Instead, I topped the bacon/potato/black bean pepper with a poached egg. Very yummy!